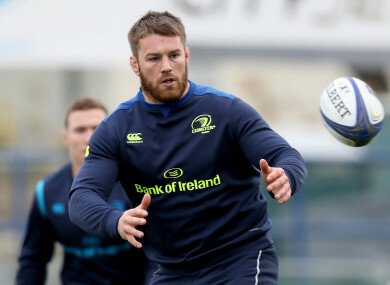 SEAN O’BRIEN REMAINS ‘on track’ to return to full fitness during this Six Nations window, but Leinster had no update to provide on the flanker’s progress yesterday. The 30-year-old has been sidelined since the province’s Champions Cup win over Exeter Chiefs at the start of December, and although he insisted there was no concern over his availability for the start of the Six Nations, was forced to have a small procedure to resolve the ongoing hip issue last month. Leinster say the target is to have O’Brien back available during this four-game block of games, but again were unable to give an indication as to when that will be, raising further doubts over whether he’ll be fit to play any part in Ireland’s championship campaign. O’Brien is definitely ruled out of Friday’s Guinness Pro14 clash with Edinburgh and having not returned to training, you would imagine next week’s game against Scarlets may come too soon for him too. Leo Cullen’s side then face the Kings at the RDS on 23 February. Asked about O’Brien’s situation yesterday, Leinster scrum coach John Fogarty said: ”There is no update on Seanie, he’s on track. “We’re hoping to get him in this block. He’s in good form, he’s on track. There is no real update on his situation. On track is a good thing. Garry Ringrose (ankle) also remains unavailable while Cathal Marsh faces an extended period on the sidelines after injuring his toe before the two-week break. Cullen will name his side to face Edinburgh on Thursday afternoon, with Leinster heading to Myreside second in Conference B having won their last five Pro14 outings. Email “'We are dying to see him back': Hip issue continues to keep O'Brien sidelined ”. Feedback on “'We are dying to see him back': Hip issue continues to keep O'Brien sidelined ”.